AROUND NEW YEARS 1908, Dr. William Sturgis Bigelow, an intimate friend of President Theodore Roosevelt, got the idea of making coins with devices sunk beneath the fields—not true intaglio, but rather with relief designs depressed so that the highest points would not be at once worn away somewhat in the manner of certain Egyptian 4th Dynasty stelae. The late Augustus St. Gaudens had bequeathed the nation designs of unprecedented magnificence for the double eagle and eagle; so hard was this act to follow that a totally new approach was contemplated for the smaller gold coins. One could not expect Mint Engraver Charles E. Barber to create anything but the most unbearable mediocrity, so that freelance sculptors had to be approached—preferably in secrecy so that Barber could not abort the project. Obtaining a go-ahead from Teddy Roosevelt on the project, Bigelow persuaded the Boston sculptor Bela Lyon Pratt to submit models in this technique. The device chosen was a naturalistic portrait of an Indian chief (name not preserved), simultaneously an impression “emblematic of liberty” as the Mint Act of 1792 still specifies (for the Indians were a free people until the white man confined them to reservations as third-class citizens), a compliment to T.R., and a continuation of a trend begun in 1899 with G.F.C. Smillie’s magnificent portrait of Sioux Chief Running Antelope on the then current Series of 1899 silver certificates, confirmed by Charles Knight’s splendid bison, engraved by Marcus N. Baldwin onto the master plates for the Series of 1901 $10 Legal Tender notes. Pratt’s eagle was worthy of J. J. Audubon, a deliberate bow to St. Gaudens, and a slap at Charles E. Barber who had revived the encumbered heraldic eagle of the Great Seal for the overcrowded reverses of the then current 25 cent and 50 cent pieces. President Roosevelt enthusiastically approved the designs, and ordered that the models go at once to the Mint for making into master dies, hubs and working dies, so that the coins of these new designs could reach the public as soon as possible. Contrary to T.R.’s orders, Mint Engraver Barber held up production by several months by insisting on working over the Pratt models. In a watered-down form they went to the Coiner’s Department, and on October 9, 1908 the first Indian head quarter eagles left the Mint, reaching the public during the next few weeks. The designs were attacked at once on account of their unfamiliar conception, one of the severest critics being a Philadelphia coin dealer (Samuel Hudson Chapman) who falsely alleged that the designs were anti-naturalistic, un-hygienic, incapable of stacking, and too easily counterfeited. (Chapman’s major objection to the eagle was well founded but the blame is on Barber, not Pratt; Pratt knew what the American bald eagle looked like, working from models and photographs, whereas Barber did not.) Despite these objections, the design remained without further modification until 1929. 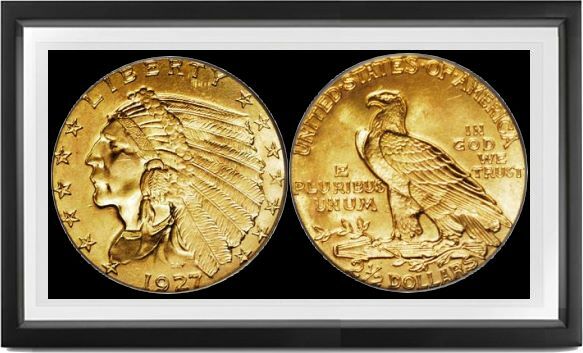 After Wall Street collapsed in that year, little gold reached the mint, and most of it was coined into double eagles for international payments; no more quarter eagles were ordered by banks. All fifteen date-mintmark combinations of this design were coined in large enough quantities to insure their permanent availability at a price, the only difficult one being 1911 D. As a result, this date has been touted as a “key” to completeness of the series, and in recent years favored by attention from counterfeiters. Genuine examples have a knife-rim or “wire edge” at the extreme periphery. The only real rarities of this design are the Matte Proofs, which were issued in very limited quantities, many being melted in 1916 as unsold. Forgers have simulated these too, deceiving only those unfamiliar with the genuine article; real Matte Proofs 1908-15 have more sharpness on all feathers and other details than do normal Mint State specimens, something untrue of the imitations. This design is overall one of the more aesthetically satisfying of twentieth century American coinage, fortunately easily available even in perfect preservation.